I’ve been hearing the word “Anthropocene” tossed around lately with increasing prevalence. There are some scientists and scholars who believe that we’ve entered into a new epoch in time hallmarked by humanity’s impact on the planet; most notably mass extinctions of plant and animal species at an unprecedented rate and global warming caused by human activities. The jury is still out whether or not there is enough evidence to show that we’ve entered into a new epoch of time, but one cannot argue that humankind has left a massive and indelible footprint on the planet, with repercussions so daunting we have yet to comprehend what they might ultimately mean. 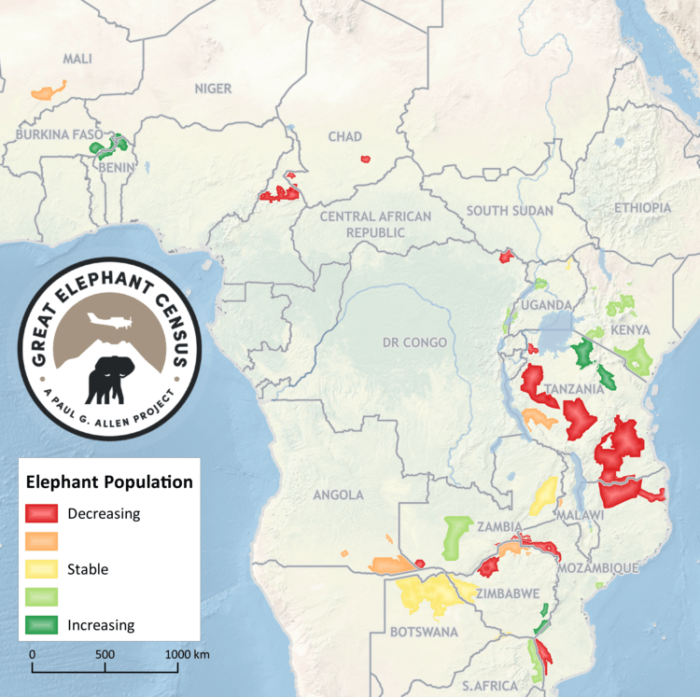 Which brings me to the very sobering report recently released by the Great Elephant Census, which implemented a first-of-its-kind, 2-year long continent-wide aerial study of the state of the African savanna elephant. The poaching problem is so acute such that an elephant is killed roughly every 15 minutes for its tusks; the elephants cannot naturally reproduce quickly enough to outpace their slaughter and are in net decline from poaching alone–without factoring in additional variables like habitat loss. Aside from being valuable beings in their own right, these intelligent and august creatures are a keystone species playing a vital role in maintaining the health of all other life in their ecosystem. Often referred to as Ecosystem Engineers, elephants are responsible for, among other things, nurturing the soil and dispersing seeds through their dung, creating grassland habitat for other animals by uprooting trees and breaking down bush, and digging watering holes from dry river beds. The loss of this species would be a tragedy on a massive scale, sending ripple effects through the local ecosystems they create and maintain; consequently, the survival of other species of plants and animals who live in these areas will be threatened. It’s hard to even fathom how an average person could contribute anything helpful to such a complex and large scale problem, particularly from another continent. The most practical thing one can do is to abstain from buying any ivory products. This is especially critical for people living in or traveling to Asian countries where the demand for ivory, particularly in China, is what is driving the mass slaughtering of elephants. Another practical endeavor is to donate to organizations dedicated to elephant conservation, research, and outreach in communities within elephant ranges to find novel ways to mitigate human-elephant conflict (like the incredible honey bee fences successfully used in three communities in Kenya). Many of these groups rely on donors to fund their activities, and donations help ensure their important work will continue. I recommend donating to groups like Elephants Without Borders and Save the Elephants, both of which are field-based operations doing important work to secure the future of Africa’s elephants. I think my infinitesimal role in this is to speak out and share this information with whoever will listen, including the few of you who are reading this right now. It goes without saying (but I’ll say it anyway) that issues that have a large and concerned audience will receive the most attention and resources to help assuage the problem. So be a voice in your own way–share this information with your friends and family. Spread awareness of the plight of elephants, and help the people you know cultivate a love and admiration for these amazing individuals. Read and educate yourself on the issues faced by elephants and why they matter. You could even hold fundraisers with friends or in your local community to raise money to donate to elephant conservation and research. Read the full Great Elephant Census report here.